It’s a strange transition, going from a week in Sri Lanka to my family’s annual week at the Frederick Fair in Maryland. The mornings are chilly here, and there are no palm trees. No Indian Ocean. No mosquitoes carrying malaria or Dengue fever. We sell ham and cheese sandwiches from our food tent just off the midway. A lot of people walk away with five at a time because for every four sandwiches you buy you get one free. That costs $19.80. Or a week’s wages for someone in Sri Lanka. We also sell a lot of soda under our tent (or “pop” for you Midwesterners). In order to stock up our tent at the beginning of the week, we bought a pallet of water and a lot of cases of Coke. In fact, our first order cost us $766.00. Or 153 days wages for someone in Sri Lanka. It’s a strange world, where the equivalent of one person’s six months of hard labor can be consumed on the other side of the planet in three or four days by people having fun. Drinking sugary drinks. For about the first week after I got back from Sri Lanka, my body clock was so screwed up that I was wide awake by 3:30am. I got a lot of work done on those early mornings, but it was also kind of fun because many of my fellow Sri Lanka bloggers were awake at that time. We’d send each other early morning messages on Facebook while most of the rest of our world was sleeping. We unofficially debriefed our experiences. We laughed about the old inside jokes and threatened reunions. Then, one morning towards the end of the week, I woke up and groggily picked up my phone to check the time. 6:30am. No more jet lag. No more middle-of-the-night conversations with my Sri Lanka blogger buddies. It felt like the trip had finally ended. It was the saddest morning I’ve had for quite some time. I miss jet lag. I miss being ravenously hungry at 3:30am. I miss the new friends I made during that week. I miss feeling connected to a country on the other side of the world that I never thought I’d visit. 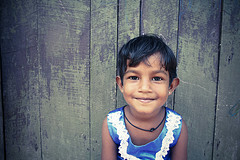 Then I see the photo of the little boy in Sri Lanka my family is sponsoring. And it’s such a little thing. Such a miniscule thing. $35 a month. I wish I could do more. It’s tough processing these intense experiences – thank you for doing some of that processing here, with all of us. All of us who need reminders of how rich we are, even when we struggle to make ends meet. We need you and your 3:30 a.m. friends to keep speaking truth to us. Thanks, Shawn. Shawn, sometimes I will talk with people about kids needing help in places like Sri Lanka. Their response will be that we need to help kids here. I ask them how they are doing that and I never get an answer. One of the things that gives me great joy is seeing the photos of Degefe and Wesley, the two young men I sponsor through World Vision. We have sponsored children since I was a kid, and to my parents’ credit, it was the time we spent learning about our sponsor kids, their countries, and the reason they needed sponsorship that taught me the most about awareness and privilege and responsibility. Bless you, Shawn, for letting this touch you and for sharing that touch with your kids and with us. I followed along with your trip, and I can’t imagine what re-entry is like. Prayers for rest and peace. Powerful post, thanks for sharing your heart (as always). Yes. I miss jet lag too. We must be a wee bit off our rockers to even articulate that! But I do — I miss calculating the time there and knowing they are up and working. And I’m pretty blown away every time I buy something here, or write a check for school fees, or pay a bill, and do the calculation to there. But this is our life, and these are our bills, and as God is changing us I have to be patient and allow the time change like that takes, financially and spiritually and mentally. It seems like more than a rude awakening from sleep as to an awakening that the struggle for life for others gets drowned out by my appetites and comfortableness. Thanks for the return to God’s heart and a reminder to me. After sponsoring another child today (and still feeling like I need to do more) I came across your blog. Thank you for your blog post and your insights into what’s going on in Sri Lanka. Thank you also for the video. Who was the music by in the video – I would like to find the lyrics.